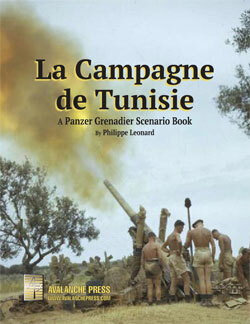 In the first segment of La Campagne de Tunisie’s scenario set, the French battle the American invaders of North Africa. Afterwards, they switched to the side of righteousness and battled against the hated Nazis. The Army of Africa fought unexpectedly hard to defend French North Africa from the Allied invasion. Operation Flagpole had been based more on wishful thinking than operational reality. Added to this surprise was the fact that the Allies had put their money on the wrong horse in Henri Giraud. Giraud was thoroughly hated by De Gaulle but this was a minor problem when it came to the North African campaign. The issue was the control exerted by Admiral Jean Darlan. In French North Africa, the Army took its direction from an Admiral. In Algiers, the only site where Flagpole actually worked, Darlan had been captured by the French resistance (along with the ground forces commander, General Alphonse Juin) and the XIX Corps of three French divisions was effectively neutralized due to command confusion. Giraud arrived two days after the initial landings and agreed to subordinate himself to Darlan, who had been released after he indicated a willingness to support the Allied cause and ordered a ceasefire. The following day the Germans, in response to their well-based skepticism concerning the French will to fight alongside the Axis, activated Case Anton, the invasion and occupation of Vichy France. At that point the Army of Africa formally switched sides and joined the Allied order of battle. The XIX Corps which had been shielded from direct confrontation with Allied forces formed to core of the French contribution to the Allied forces in French Africa and was a full participant in General Kenneth Anderson's First Army that moved towards Tunisia from the west. While a great many French North African soldiers were available, the need to provide additional equipment to outfit those units required time to deliver and training to master. Most of those units would not be available for the better part of a year, ultimately fighting in Italy or landing on the Riviera. In addition, the units that had fought the Allies had been roughly handled and needed time to reorganize and, in some cases to forget who had been shooting at them a short time ago. Nevertheless, the immediate availability of an entire corps of French troops made a substantial contribution to the Allied campaign in Tunisia. The XIX Corps and the remainder of the Army of Africa formed a large part of the French contribution to the Allied effort; however their incorporation into the Free French forces did not proceed until Admiral Darlan met an untimely end in December 1942 at the point of a gun wielded by a French monarchist. Following Operation Torch, German troops landed at Tunis' El Aouina airfield. Both sides started a race to control key terrain in Tunisia and the former Vichy troops were still in the middle of them. One of these key points was the bridge over the Medjerda River and the road junction at Medjez-el-Bab. The motorized Groupement Le Couteulx reinforced by six Renault D1 tanks had orders to delay the Germans but avoid direct combat, and fell back gradually towards Medjez-El-Bab. German paratroopers were delayed by the French outposts which parleyed without fighting, while 300 British airborne troops dropped on Beja in the west. When German air support finally arrived, the German paratroopers moved out. This confrontation marked the first contact between the Allies and Germans in Tunisia and also the commitment of the French Army against Nazi Germany. The German paratroopers took the eastern side of the Medjerda and got as far as the bridge where they were stopped by heavy French machine-gun fire. An assault detachment under Oberleutnant Bundt went down the river, crossed, and then entered the western portion of the town. In a desperate fight, the assault detachment was practically wiped out. In the afternoon, Italian reinforcements arrived and the bold German commander bluffed the Allied forces into pulling back. A tiny but well-armed group of German paratroopers with stratospheric morale is on the attack against the French, who are themselves pretty enthusiastic about fighting les boches. This scenario takes place on the river map from Conquest of Ethiopia/Africa Orientale Italiana, one of the nastiest bits of terrain in the Panzer Grenadier series. The Tunisian campaign represented, among many other things, the first field test of the U.S. Army’s tank destroyer doctrine. Company B of the 701st Tank Destroyer Battalion had travelled overland from the vicinity of Oran. Arriving in Feriana late at night after a long march, it was ordered to attack the enemy-held town of Gafsa. When dawn came, the Americans deployed an attached recon platoon forward to locate the enemy and placed the vulnerable unarmored 37mm-armed tank destroyers of the light platoon in the rear with the two heavy platoons on either side of the main road. Two antique French armored cars also arrived to join the attack. As the advance neared Gafsa, two P-38s roared overhead and strafed the town. The recon vehicles came under fire from outlying buildings and split into two sections to cover both flanks. While the heavy tank destroyers silenced the snipers by blasting the buildings with 75mm high explosive, the French armored cars sped forward along the road. One of them hit a land mine, blowing all four wheels off. With no infantry support, the tank destroyers used fire and maneuver to press the assault. One heavy platoon and the command group made a frontal assault on the town while the other heavy platoon made a flanking attack. Using their halftracks like tanks, the tank destroyer crews entered Gafsa firing as fast as they could. Before noon they took a number of prisoners including 300 Arabs who had been armed by the Germans. The Germans in this scenario probably hadn’t read the rules on assault combat: half-tracks without infantry are fantastically vulnerable to enemy close assault, where morale really counts. And the Germans have some paratroopers with enormous morale along with those armed Arabs. The French player will have to take care with those tank destroyers. The defiles which lead from the Ousseltia valley onto the coastal plain and south-eastward to Kairouan were key openings in the Eastern Dorsal Mountains and thus hotly contested by both sides. Since 17 December, German motorized units were constantly attacking and infiltrating the passes. On 19 December, before dawn, the Brigade Légère Mécanique, the lone French fully motorized unit, took over the defense line including Pichon. The ground was soaked wet by the heavy rains. Early in the afternoon, artillery fire fell to the east of Pichon. The ensuing German infantry attack was spearheaded by armored cars. The French infantry supported by old 75mm guns resisted the first assault albeit with rather high losses. Later the French counterattacked several times, pushing back the enemy and allowing some reinforcements to reach Pichon. The Brigade Légère Mécanique - raised in secrecy under German rule with the motto “Contre Quiconque” (“Against Anybody”) - kept control of the eastern passes for a few more days. An even motlier than usual – but once again, enthusiastic – French collection stands against a German attack over some pretty rough ground. There’s not a lot of artillery for either side, but it’s all heavy artillery. While the French have terrain in their favor, the Germans do have mobility. Following a failed Christmas Day attack the French XIX Corps asked for Anglo-American support. The new attack would be made by Moroccan infantry backed by American tanks, starting from the crossroads of Oum-el-Abouab up through the mountains toward the village Bahalil. There was a large Kasbah half-way between Oum-el-Abouab and the top of the pass. The main attack would be flanked by advances from other battalions in direct support including a tabor of Goums. The attack began well enough with the French colonial troops full of confidence but yet another uncoordinated attack over rough terrain in awful weather resulted in failure. The American tanks without radios were unable to turn the tide; their commander was killed while desperately running from tank to tank giving directions and orders. They even lost several tanks to anti-tank fire. The dazed and demoralized survivors withdrew only to be fired on by their French allies! The French gunners, very tank-conscious and who had only a few weeks before been fighting the Americans around Oran, made short work of the surviving American tanks. With the loss of all the supporting tanks, the French attack melted away leaving the Axis in control of the hills. The French are on the attack against the Italians, who have good positions and are pretty tough, backed by plenty of support weapons and a huge amount of really poor off-board artillery. Initially scheduled for 20 December, a French attack would push through difficult mountainous terrain to threaten the Pont-du-Fahs - Enfidaville and Pont-du-Fahs - Kairouan roads. The reinforced Carpentier group was in charge, combining 4e Régiment de Chasseurs d’Afrique and Foreign Legion elements. After several firefights in the last rainy days of December, between Henchir Moussa crossroads and Henchir Karachoum pass, Colonel Lagarde eventually launched a combined arms attack on the pass. Carefully prepared and supported by 155mm guns, the French assault started at 0630 and it reached its objectives at noon quite easily. The joint attack by Goums, Légionnaires and armor of the 4e Régiment de Chasseurs d’Afrique completely overwhelmed the Italian infantry stationed around the pass. The French have the Foreign Legion! And the Moroccans! The Italians get . . . a company of German replacements. It’s a strong position for the Italians, but the French have the Foreign Legion, and the Moroccans.